And you say it’s just a comic! *This blog post has also been published at www.womensweb.in. Ever wondered that a comic strip can hold so many secrets to life? When I came across ‘Calvin and Hobbes’, the most popular comic strip worldwide, I was filled with awe and a regret at the same time. Regret that why had I missed such a wonderful piece of art during my childhood? Wrapped in humour and wit are the various truths of life! The comic strip revolves around Calvin, a six year old boy with profound perspectives on life and his fantasy friend Hobbes (a stuffed tiger doll which comes to life in his private musings. Together they explore entire new world making you chuckle and contemplate at the same time over the bigger idea. The comic strip is a must read for all the adults who want to relive their childhood and for kids so that they never lose theirs. Calvin’s friend Hobbes was entirely created in his mind, yet together they explore the world and the endless possibilities. What a gift imagination is! Often we come across people who are not happy with their lives, their carriers, their relationships, and so on. The reason for this being they never knew what they wanted. For example, at my office 7 out of 10 people are those who never wanted to be in the job they are currently in. However, they realized it much later. It is important to spend time with yourself alone, to introspect, and discover who we are. We often wish that the good old days of our lives would come back. When we were at school, we wished for weekends to come. However, when we left school for college, we wished the time would go back. Similar was the case when college ended and we headed off to make our careers. However, nothing is permanent in our life. We can’t stagnate, time goes on. Had it been we had got all that we wanted, we would never have appreciated it the way we do it today. Life is in the moments that we make along our way. Live them fully for when you will look back you will realize they were big things. Truly, denial is the state of our mind we spend most part of our life in. We are never satisfied with the way we are and often want to live someone else’s life. Often the relations or riches in our friends or colleagues or even a stranger’s life seem to be much better than ours. Rather than accepting who we are and what we have, we wish to live someone else’s life. If only we could accept and believe in ourselves, brushing aside our imaginary fears and insecurities, life would be a lot more beautiful. Little Calvin faces an ethical dilemma while cheating on a test. Whether he should cheat and succeed or accept the consequences for not studying? Through his statement Calvin brings to light the universal problem we all face in our lives when we have to choose between success and our principles. What should we opt for? Bend our rules or stick to it? We fail this test of life on many an occasions. Perhaps, that is why our life seems to be a mess at times. 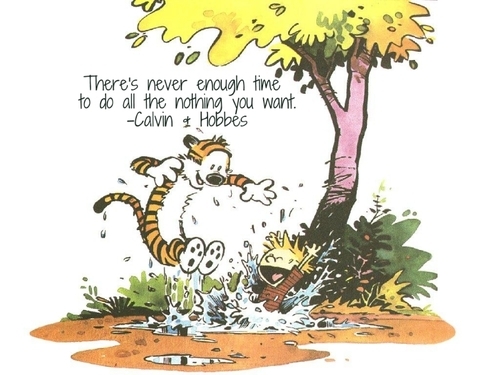 Exploring new heavens in the womb of nature, lying down beneath a cool shade of a tree and doing nothing but sleep, and splashing or jumping in the ponds are some of the things Calvin and Hobbes do in their afternoons. However, the beauty and magic of nature remains under appreciated by kids of our generation. The advanced technology, gadgets, iphones, and numerous other equipments have become a part of our culture. Nature needs to be preserved and appreciated. And, this is not the end. There is much more to the comic. Fun, madness, innocence, adventure, and childhood all entwined together in one go. So, have you explored the wonderful world of Calvin and Hobbes?